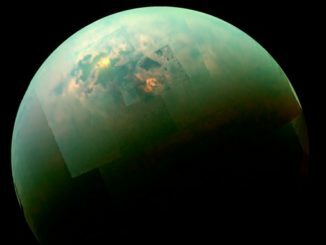 During the Cassini spacecraft’s final close flyby of Saturn’s moon Titan, small-but-deep lakes of pure methane were found atop mesa-like landforms. For lunar and planetary enthusiasts, the only naked-eye planet of the evening sky is distant and tiny Mars in the constellation of Taurus. 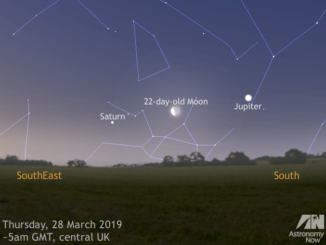 But if you’re prepared to be an early riser, the dawn sky is where you’ll find two of the solar system’s heavyweights, Jupiter and Saturn, getting up close with the Moon on 27 and 29 March, respectively. 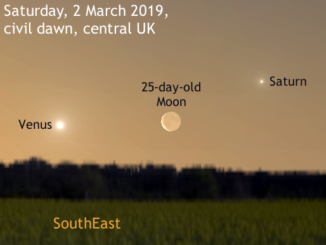 On Saturday, 2 March 2019, observers in Western Europe should seek a location offering a level and unobstructed southeastern view at civil dawn (some 36 minutes before sunrise in the heart of the UK) to have a chance of seeing the 25-day-old waning crescent Moon between Venus in Capricornus and Saturn in Sagittarius with the unaided eye. 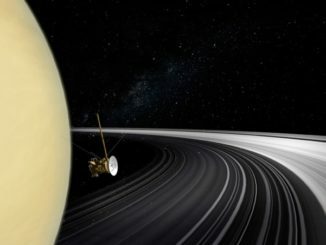 Analysis of data collected near the end of the Cassini spacecraft’s mission to Saturn indicate the planet’s spectacular rings are a relatively recent phenomenon. 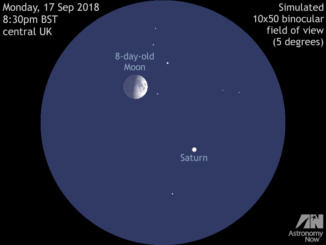 Skywatchers in the UK looking to the south-southwest at dusk on Monday, 17 September can see the waxing gibbous Moon just 1¾ degrees to the upper left of Saturn, the pair fitting comfortably in the same field of view of binoculars and small telescopes magnifying 25× or less. This is also a good night for spotting Titan, Saturn’s largest and brightest moon. 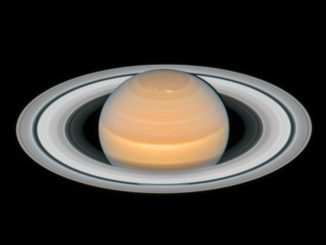 The Hubble Space Telescope captured this spectacular view of Saturn last June, showing six of the ringed planet’s moons, during an ongoing study of outer planet atmospheres. This view expands on an earlier version posted here in July. 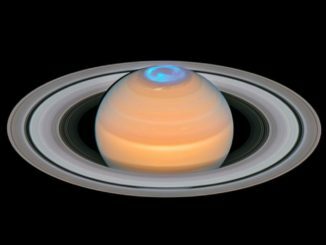 The Hubble Space Telescope’s imaging spectrograph captured Saturn’s spectacular aurora flickering over the ringed planets north polar region over a period of seven months in 2017. 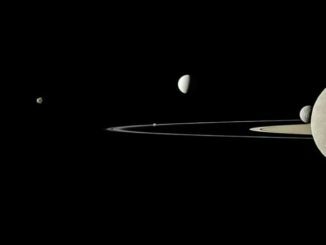 In 2011, NASA’s Cassini spacecraft captured a view showing five of Saturn’s moons – Janus, tiny Pandora, the water world Enceladus, Mimas and Rhea, the planet’s second largest moon – in a single frame, a family portrait that is riveting in its stark beauty. 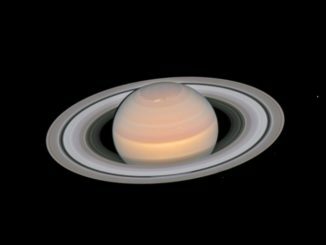 The Hubble Space Telescope captured stunning new views of Mars and Saturn as the planets neared opposition, lined up with Earth and the Sun. Mars remains obscured by a global dust storm. 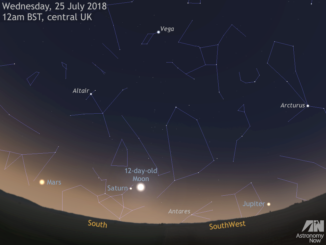 If clear skies persist, observers in the UK can view four naked-eye planets between now and the end of the month. Brightest planet Venus is visible low in the west some 45 minutes after sunset, while the waxing Moon is your celestial pointer to Jupiter, Saturn and Mars between 21 and 28 July at midnight.